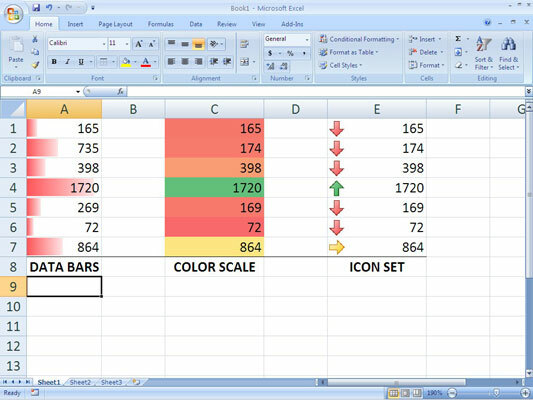 In Excel 2007, you can instantly apply data visualizations to cells by using data bars, color scales, and icon sets that help you quickly understand data variations in your tables. Excel provides several options as thumbnails that you simply click to apply the visualization, but you also can specify your own rules for when to apply the visual formatting. For example, you can change the colors used in a color scale gradient to match other colors used in a particular worksheet. Click the Conditional Formatting button in the Styles group on the Home tab. 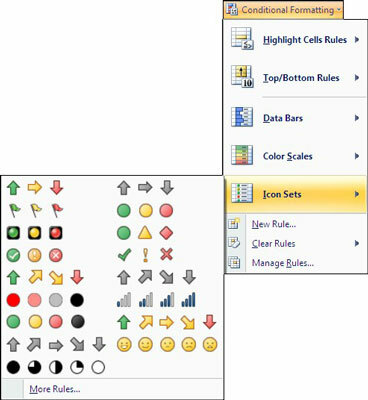 Examples of data visualizations in Excel 2007: data bars, a color scale, and an icon set. Data Bars: A gradient-style bar helps you see the value of a cell relative to other cells. The length of the data bar represents the value in the cell, so a longer bar represents a higher value and a shorter bar represents a lower value. The data bars have six different color options designed to match Excel themes. Color Scales: Designed to visually help you understand your data, color scales compare a range of cells by using two colors representing higher or lower values or three colors representing higher, middle, or lower values. The color scale bars come in eight different color themes. You can also create your own scheme by choosing More Rules under the Color Scales options. Icon Sets: Icon sets help you classify data into three, four, or five categories, with each icon representing a range of values, such as higher, middle, and lower. Icon sets include arrows, traffic lights, clocks, and flags.